The Learjet 75 is the latest aircraft from the Canadian based aircraft manufacturer Bombardier. The aircraft has received its type certificate from the FAA on 14 November 2013 and deliveries began shortly thereafter. 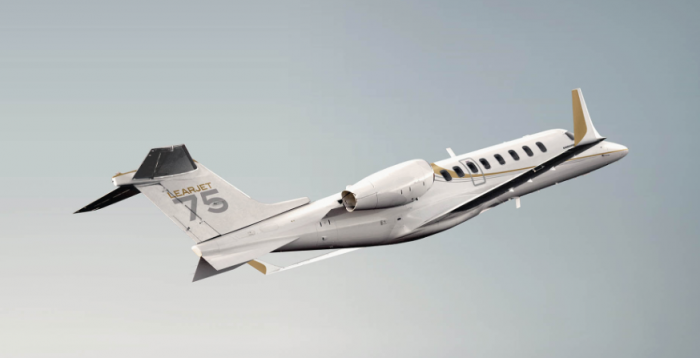 The airframe itself is based on the Learjet 45 models while its wing design is based on the Global series. Baggage Capacity: 50 cu ft. The cabin of the Learjet 75 is in a class of its own, designed for ultimate comfort and privacy featuring a flat floor for ease of movement, pocket door for reduced noise levels, as well as being fully-equipped for productivity. The newly designed luxurious interior is built for efficiency and comfort, the Learjet 75 easily accommodates the needs of the passengers. In addition the Learjet 75 has one of the most technologically advanced cabin in its class. It boasts a state-of-the-art cabin management system, high-definition bulkhead monitor, integrated sidewall speakers, and six personal touch-screen monitors that stow or deploy as needed. It now has more legroom, a flat floor, fold-down ottoman at the VIP seat and a high-tech cabin management system. With revolutionary aerodynamics for greater performance in hot climates, high altitudes and short-field capabilities, and this jet is the epitome of fit, finish and performance. For more information on chartering the Learjet 75, price out your flight here for an instant quote.